Imperial power derives from empires like the Roman and the British Empire, while fascism usually thrives under dictators like Hitler and Mussolini. Imperial power usually lasts much longer than fascist power as the former is not as brutal as the latter, and is largely supported by the citizens of the empire who identify with its glory. Fascist regimes are totalitarian and oppressive and usually last as long as the writ of the dictator who enforces it runs. Take the case of the Roman Empire it lasted several centuries and its impact is still felt in the culture, arts, philosophy and politics of the western world. Similar is the case with the British Empire which too lasted for over two centuries. Its impact on its former colonies is clearly visible. The impact of fascists like Hitler, Mussolini, and even Stalin were enormous when they were around, did not last. Today’s Germany, Italy and Russia do not care for much for their legacy. According to Fascist ideology nations and peoples around the world are adversaries of each other and only the strong can assert themselves by virtue of their toughness. 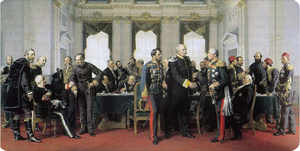 Though there have always been empires in the ancient world with the Greeks, the Persians, the Chinese and the Indians having held sway over vast territories and peoples, the age of imperialism really pertains to the endeavors of powers such as Britain, Japan and Germany in the late nineteenth and early twentieth century to colonize vast regions in Asia and Africa. Fascism as an ideology is nowadays looked upon with revulsion, as it is associated with gross violation of human rights including the right to freedom of speech and expression The record of fascist dictators has been abominable, when it comes to oppressing large sections of people, Stalin, Hitler and Mussolini are guilty of the death of millions of people who were victims of their paranoias and lust for power. Empires on the other hand, though remembered for the excesses committed in its name like the colonization and destruction of native ways of life, is now viewed more as a part and parcel of the history of mankind-something which gave the world many good and bad things. The British for example united India in the sense that for the first time in its history the people felt a sense of nationhood. They introduced railways and telegraph, built roads and bridges across the length and breadth of the country, and gave the Indian people a professionally trained armed force, and introduced the Indian penal code. They also brutally suppressed the Indian aspirations of freedom. On balance however there is sufficient nostalgia of the British Raj in both India and Britain. Fascism however led to horrendous tragedies. The prosecution and mass murder of millions of Jews in Hitler’s Germany, and the killings of millions of Russians in the infamous Stalinistic purges is the bloody legacy of fascism. 1.Roman and British Empires exemplify imperialism. 2.Hitler, and Stalin exemplify fascism. 3.Imperial power usually lasts much longer than fascist power. 4.According to Fascist ideology nations and peoples around the world are adversaries of each other. Manisha Kumar. "Difference Between Fascism and Imperialism." DifferenceBetween.net. May 19, 2011 < http://www.differencebetween.net/miscellaneous/difference-between-fascism-and-imperialism/ >. You are very much wrong. Fascisim is a very, very different thing (ideologically speaking) to Stalinism, which is in turn, a subdivision of Communism and Leninism. Hitler was not a Fascist, he was a National Socialist, a political movement funded in Germany somewhat based in Italian Fascism. The first one exalted Race and Nation, while the latter preached with unity in Religion (Catholicism) and Culture. Fascism and NS shared many common beliefs thus they made an alliance between them and later with the Japanese Empire and its very own Japanese Militarism/Imperialism political movement. Stalin was never a Fascist (far right), he was a Communist/Marxist (far left) in theory at least. Fascism and Communism are one against each other in every sense. You should read the “Manifesto of the Communist party” and “The Capital” both by Karl Marx and Friedrich Engels to further understand the Utopical Communism and Socialism. Fascism and NS are in turn based in more “Right-wing” politics such as: the Catholic Church, Racialism, Scientific Racism, State Cult among some other philosophies. NS was based with the book “Mein Kampf” by Adolf Hitler. While the far Right and far Left share many things such as: “Statism” or cult in the State and Government, cult of personality, absolutism, racism and other stuff doesn’t make them in any way ideologically compatible. Modern far-right movements are found in many countries such as France (anti-immigration), Germany (Neo-Nazi, Imperialists, Royalists, etc), US (Nativism), UK (Conservative), Iran (Islamic Revolution) , Israel (Zionism), Russia (White movement) and many others. If you want more info please let me know with an email. Sources: International Relations and Political Studies in Humboldt Universität, Berlin. I am an Indian and when I view history dispassionately, I find that imperialism and fascism are faces of the same coin. Churchill and Hitler were essentially both of same character. Haughty, boorish, amoral and racist. A Jew from modern-day Israel, though he may be of European descent and white, may feel that Churchill was better than Hitler because of what the latter did to Jews, but from an Indian stand-point of view, Churchill was an equally ruthless, pitiless and blood-thirsty animal.